https://sep.yimg.com/ay/yhst-33477391359232/acropora-coral-neon-color-acropora-species-9.jpgAcropora Coral (Neon Color) - Acropora speciesDifficultSemi-aggressiveYesCalcium, Strontium, Trace elementsIndo-PacifcAcroporidaeSmall 2" - 3"
Taxonomy: Acropora Coral belongs to the Kingdom Animalia, Phylum Cnidaria, Class Anthozoa, Order Scleractinia, Family Acroporidae and Genus Acropora. Other names: The standard scientific name of Acropora Coral is Acropora species. 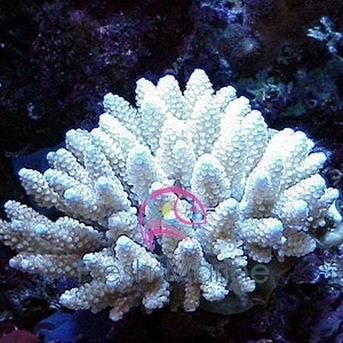 A common specific scientific name of Acropora Coral is Acropora cervicornis. Common Names: Staghorn Coral and Super Colored Coral. Origin or natural range: Acropora Coral is found in Florida, the Caribbean Islands, the Bahamas, the western Gulf of Mexico, Venezuela, the Indo-Pacific region including Fiji. Size: The length of Acropora Coral ranges between a few centimeters and over two meters. With the branches of Acropora Coral growing at the rate of five to ten centimeters per year, the Coral attains its maximum growth size at the age of ten to twelve years. Color: Acropora Coral occurs in purple, cream, yellow, green, pink and blue. Compatibility: The Acropora species is semi-aggressive towards the other marine aquarium invertebrates. Acropora Coral occurs on the back reef and the front reef, at a depth of zero meters to thirty meters in the marine water. The depth of occurrence of the Acropora species is contingent on the strength of water current, the saturation level of water and the intensity of light. Generally, the skeletal structure of Acropora Coral is cylindrical and branched with the height of a branch ranging between a few centimeters and two meters plus. The branched skeletal structure of the Acropora species gives it a bushy appearance. In some species of Acropora Coral, the skeletal structure may be shaped like a table or a regular cluster. The branches of the Acropora species emerge from a flat central base. Acropora Coral reproduces asexually through budding. Each resulting fragment then germinates on the substrate to grow into an individual coral. The Acropora species propagates sexually through spawning, in which the coral releases sperms and eggs into the water. After fertilization, a coral larva called planula forms, which after some time settles down to grow. Very small percentage of larva is able to survive and develop into a coral. pH of water: 8.10 to 8.20. Water flow in the aquarium: Acropora Coral needs the high intensity of intermittent water flow in the marine aquarium it hosts. The Acropora species requires high-intensity lighting in the marine aquarium it inhabits. Intense Metal Halide lighting is recommended for Acropora Coral. T-5 or Compact Fluorescent lighting may also work fine if the Acropora species is placed at a high level in your marine aquarium. You can place Acropora Coral anywhere in your already established reef tank. The Acropora species grows rapidly in a favorable marine environment. Acropora Coral derives its nutrition chiefly through photosynthesis which is performed by zooxanthellae, a photosynthetic alga living symbiotically within the coral. The Acropora species is Carnivorous in feeding habit and filter feeds a few times per week when open. Acropora Coral feeds upon acellular marine invertebrates, meaty bits, zooplankton and phytoplankton. Add Calcium, Strontium and trace elements as the dietary supplements for the Acropora species. Keep the Nitrate and Phosphate levels at zero in the marine aquarium water. Breeding: Acropora Coral can breed well through asexual reproduction, in a marine aquarium. It is very difficult to maintain Acropora Coral. The Acropora species is susceptible to diseases, recession and bleaching and therefore, quite prone to death at the colonial level. Acropora Coral is adversely affected by the changes in the environmental conditions therefore; ensure the relevant marine aquarium atmosphere for the Acropora species regularly. Being hyper sensitive to many external factors, the survival of Acropora Coral is very difficult and over the years its population has crashed, thus making it an endangered species.